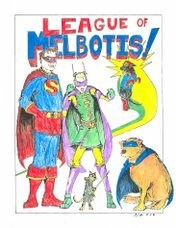 League of Melbotis: Short hiatus! I've been in a @#$% mood since yesterday, and I'm coming up short on this blogging business for you guys. Keep sending in end of year lists, and/ or talk amongst yourselves. When inspiration strikes, I shall be back. In the meantime, I leave you in Wonder Woman's capable hands. While I have no great, vested interest in Wonder Woman, I'd very much like to see a feature film. Live action, too. I just don't think an animated feature would have the epic scope and grandiosity that the Amazon deserves. I think you will see a live action Wonder Woman in the next few years. But I also am not confident that the producers will fully understand the character enough or be able to step outside the Hollywood mold enough NOT to cast some 105 lb. debutante into the role. Wonder Woman always struck me as pretty abstract and fantastic. More so than Superman for me. I think the character would work well in an alternate reality 1940s time frame. Of all the mainstream actresses working today, I think Jennifer Connelly comes closest to looking the part. She's got a commanding presence, to say the very least. Anyway, I Heart Jennifer Connelly, and I've felt that way since Labyrinth. But I think its important that Wonder Woman either be built like the current crop of American Gladiators or else like a female track star (and not like, say, Usain Bolt). 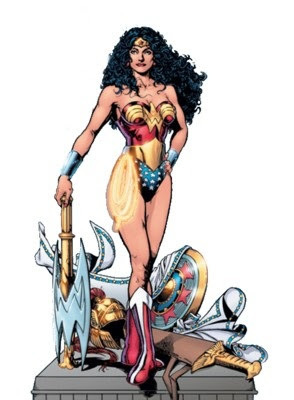 But that's me wanting to see the Wonder Woman on the comic page come to life (like, swinging battle axes and whatnot). Unfortunately, I do not know how deep the talent pool is of lovely, talented actresses who might be able to pull your head clean off your shoulders. All that said, I would cheer the casting of Ms. Connelly rather than, say, Megan "duh..." Fox.